CLASSES: We have three training programmes. Children; Many kids in Kawangware both in-school and out-of-school have no access to computers. 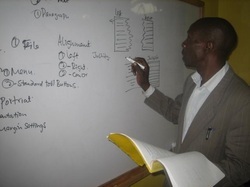 At the Centre we have devised a special kids computer classes for both in-school and out-of school children.The classes are done over holidays and weekends free of charge. 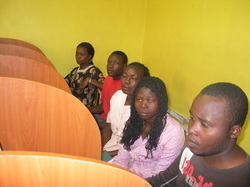 Youth; The is also a free of charge basic computer training for the youth at the project. Community Members; These are members within Kawangware and it environs who comes for training and pays at considerate affordable rates and on installments basis. Basically we have five classed per day. Classes run from 9:30 am to 7:30 pm. Each class has four students. We do also have weekend classes, that’s on Saturday and Sunday and these classes take five hours; 10:00am to 3:00pm. We have scheduled our classes to meet community needs depending on when and how they have extra time to study. Currently we have over 50 students who have successfully completed their studies. We do have a Three-month time table for students to complete the course. However due to irregular power supply, the course can extend up to 140 to 160 days depending to power supply. Our subjects are based to international standard of computer training. I.C.D.L syllabus. i.e. 7 units. David is well trained in many fields. Apart from training in computers he also do career guide & Counseling at the job center located within. Most of our student who have successful completed computer course and undergone through Job counseling Centre are now working with reputable firms.